ID: 48 ~ Source: Bowdich, T. Edward. Mission from Cape Coast Castle to Ashantee. London: John Murray, 1819, Plate 10, p. 347. ~ Creator: Thomas Edward Bowdich ~ Date: 1819 publication of an 1817 visit. 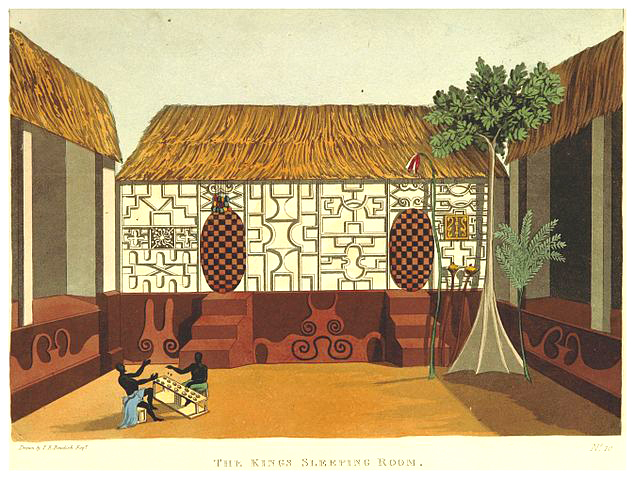 Two courtiers play oware, the capture game popular throughout Africa and parts of Asia, in the courtyard where Asantehene Osei Bonsu's room lay. Its exterior is covered with extensive mud reliefs at both the base and facade, and the two doorways are hung with checkerboard-patterned wooden doors.